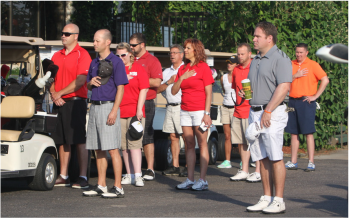 The Round for the Red began in 2005 when a member wanted to do something to support the American Red Cross after he saw their compassion for apartment residents when responding to an apartment fire. Supplier and apartment members, alike, look forward to this golf tournament every June. They say it's a tournament they never want to miss because it's just so much fun. It's more about the camaraderie and the cause than it is about the seriousness of the game. The proceeds of this tournament are split, with $10,000 to sponsor the Star of Excellence and then 70% benefiting the Midway Chapter of the American Red Cross and 30% to fund programs for the AAGW. After ten years of supporting the Red Cross, the AAGW was interested in doing more. We wanted to provide our members with a hands-on experience to help our community neighbors. We encouraged apartment communities and suppliers to host a drive for personal items that we could include in a bag for clients of the Open Door. Then, at a December Membership Meeting, our members assembled bags that included personal grooming and hygiene items as well as some small toys, books and snacks for kids. A supplier member offered a delivery truck to transport over 100 bags and about a dozen members stayed at Open Door to help distribute bags when clients came in to pick up a box of food for the holidays. ​The event was such a success that we decided to dedicate a late fall meeting each year to be our annual Give Back Event to benefit the Center of Hope. AAGW leaders were honored at the 2016 NAA Education Conference in San Francisco with the NAA Community Service Excellence Award. For years, other apartment associations have been amazed at the amount AAGW has been able to raise to benefit the American Red Cross. AAGW has been able to donate nearly $250,000 over the length of this 14 year partnership.